Papaya SaladPapaya the tropical fruit, is the powerhouse of folate, vitamin-A, magnesium, copper, pantothenic acid and fibre. To count the health benefits of papayas, it contains helpful antioxidants that lower the risks of cancer, regulates the bowel movements, and prevents chronic diseases like asthma and diabetes. Hence, it is essential to add papayas into your healthy regime. Dear readers, we bring to the exquisitely tasteful papaya salad at its best! 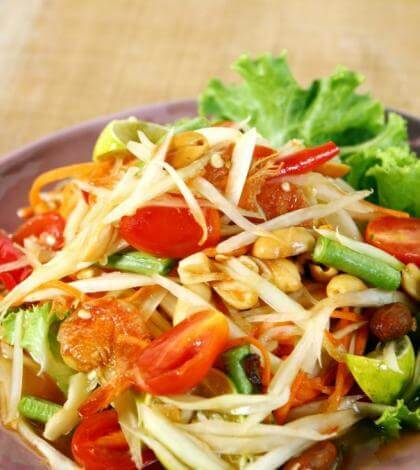 Keyword Papaya Salad- The Delightful Taste with Sunlit Tropical Colours! In a big bowl, mix all the above mentioned ingredients nicely. Keep the papaya salad in the fridge for 1 hour and serve chilled!